The physicians and staff of South Bay Vascular Center and Vein Institute welcome you to our practice. We are honored at the chance to earn your trust and to serve as your doctors. WHY DO PATIENTS SEE A VASCULAR SURGEON? Many of our patients suffer from swollen, aching legs; painful, non-healing leg wounds; blood clots (DVT); dialysis access problems; varicose veins and peripheral arterial disease (PAD). Vascular surgeons also treat patients who are at risk for stokes and limb amputation by restoring blood flow to the brain, vital organs, the hands and feet. South Bay Vascular Center surgeons, Dr Polly Kokinos and Dr Brad Hill bring an unmatched level of surgical and clinical expertise to the practice of vascular surgery. Specializing in difficult and complex vascular procedures our surgeons perform Carotid Artery Endarterectomy (plaque removal to prevent strokes), Endovascular Aneurysm Repairs, Peripheral Revascularization, Aortic Aneurysm Repairs, Angioplasty, Dialysis Access creation and maintenance, and procedures involving the superficial and deep venous systems. Recognized as two of the most experienced and respected vascular surgeons in Northern California, the practice of Drs. Hill and Kokinos is focused on restoring the circulatory health of their patients thereby helping them return to a normal way of life. Together, our surgeons have performed more complex vascular procedures than any other Vascular Surgeons in Northern California. Recognized as San Jose's and Silicon Valley's most respected varicose vein experts Dr. Kokinos and Dr. Hill have performed over 20,000 vein procedures over the past 25 years and are not only the most highly trained vein specialists in San Jose, they are also the most experienced varicose vein experts in all of San Jose, Silicon Valley and the entire San Francisco Bay Area. With offices in both Campbell and Gilroy, CA our clinics are centrally located in the South Bay and are easily accessible to the patients we serve. WE OFFER EXCEPTIONAL CARE; NOT THE "STANDARD OF CARE"
Delivering exceptional patient care involves much more than simply being the best practitioner. Exceptional patient care demands compassionate care. Board Certified Vascular Surgeons, using the most advanced operating room technologies, techniques and devices, supported by a professional staff of experienced and compassionate nurses enables us to deliver unrivaled medical care. In our private, state of the art nationally accredited out-patient ambulatory surgery center, South Bay Vascular patients receive the most advanced treatment available in a personalized setting from a diverse and multi-cultural group of professional care givers. 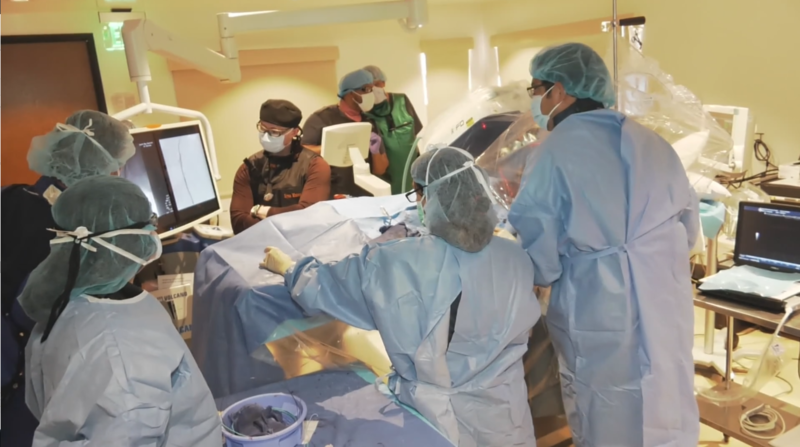 Our high tech surgery center is an alternative to the traditional hospital setting and our patients are cared for in a way that just does not happen in a hospital. In our suite, patients are treated with dignity and respect and are our number one priority. By making things easier for our patients, we believe we provide a better health care experience for our patients. Our goal is simple: It is to ensure the best possible outcomes in the most difficult of circumstances. We Offer Hope When Others Say There Is None ! Click one of the boxes below to learn more about what we do and how we can help. Polly and her staff are awesome. My husband had been living with vein issues for quite awhile. My theory is if you don't like something, change it! We live in Gilroy, so ideally location was an issue. I read an ad in a local paper, made an appointment for him. Vicki who schedules and is super friendly got him in that same week. He had a consultation with Polly, she explained what the treatment was, all the details, wear supportive stockings etc. and Polly is fun to talk to in addition to her professionalism. I can't tell you after all said and done, how happy he is! His confidence, self esteem and wardrobe has increased I am happy for him. We were so impressed with Polly, that I too decided to have my hands ( large protruding veins) taken care of. I use to cover them up in photos, no more! This was a great experience, we are so glad we found Polly, and if anything else "pops" up we will be back! flow without success, we both decided that it was time for the amputation. approach to every patient is more than admirable. human being. He has been a source of constant unconditional support and guidance throughout my husbands illness which would not have been as smooth sailing otherwise. At South Bay Vascular Center and Vein Institute our goal is simple: to ensure the best possible outcomes in the most difficult of circumstances. Our physicians provide FDA approved medical treatments in our 7000 square foot state of the art Accredited Ambulatory Surgery Center. Centrally located in Campbell, CA., our Vascular Surgery Center of Excellence enables our Surgeons to provide cutting edge care in a compassionate and caring environment. NOT ALL VEIN CARE IS THE SAME !